Do you ever watch those recipe videos on Facebook and get really hungry? Me too. 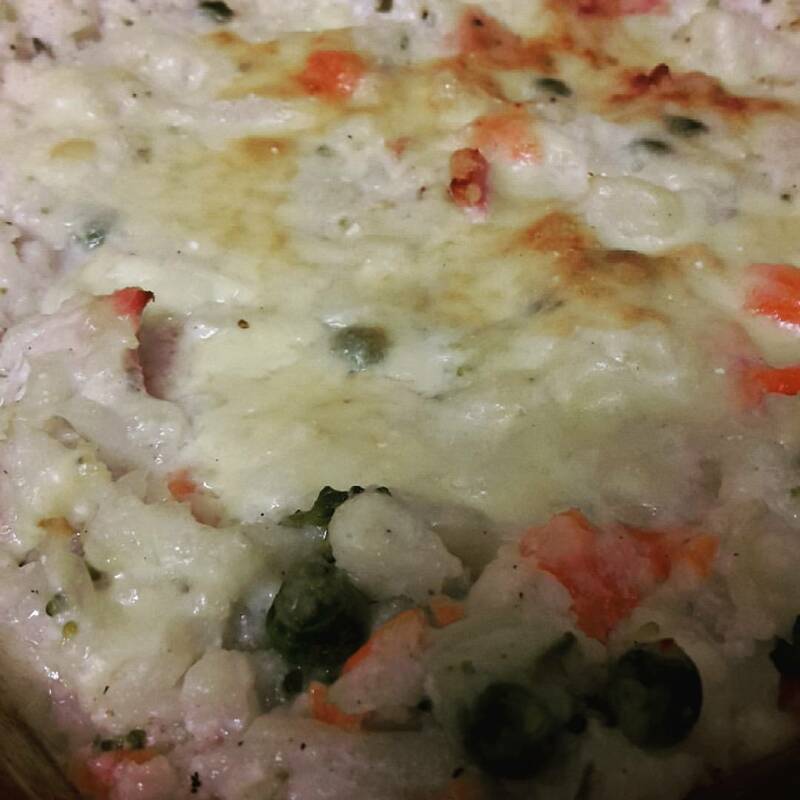 Last night, one of my friends linked to a video for Loaded Cauliflower Casserole and it got me hungry and wanting to create this dish to be Slimming World friendly. So I went out shopping today and picked up a Cauliflower and we had this for Tea tonight. 1. Boil or steam the cauliflower florets until tender and cook the frozen vegetables. Drain both. 2. Grill bacon. Chop bacon into bite sizes bits. 3. Combine quark, fromage frais, chives, pepper, and mustard. 4. Stir quark mixture into vegetables, add chopped bacon. 6. Bake at 200C 25 minutes or until bubbly and cheese is golden. Syns per recipe: 6 (for the cheese). This recipe is easy to adapt for vegetarians, just omit the bacon or use veggie bacon. If you are following a Low Carb High Fat diet, use full fat cream cheese and sour cream instead. Breaking up the Austria posts to bring you a recipe, because I am trying to be back on the SW train. I actually managed to lose 3 pounds over the three weeks I was away, but then since being back I actually gained a half stone. Grrrr. But I’ve got my SW planning journal and a new countdown and I’m trying to be ON IT. FOCUS! I’ve regained so much weight after my great success and it really upsets me a lot. Anyway…. 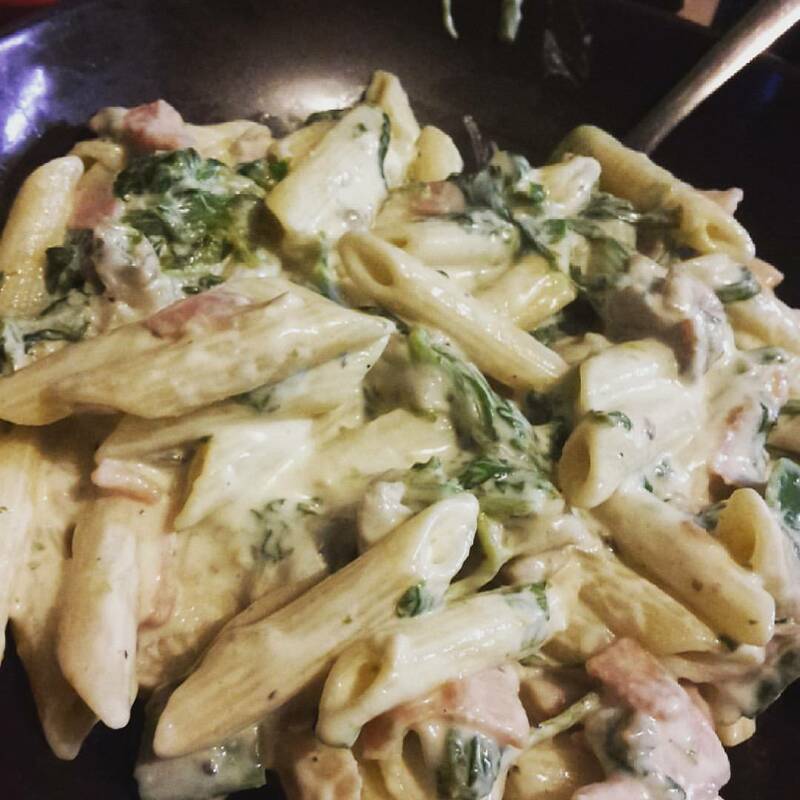 Tim asked me a while ago to come up with a carbonara, and it took me age, but I finally have come up with one that’s really tasty! 1. Cook the pasta according to the directions on the package and add the frozen spinach the last 5 minutes. 3. Add the ham and while the ham is heating up, drain the pasta and spinach and rinse in hot water. 5. Divide between two plates and serve with a large salad. We both loved this, but it did make a lot for even the two of us and I couldn’t eat all of it. I wouldn’t freeze this because I’m not sure how quark would freeze. If you wanted, you could use your HEA and use cream cheese instead of quark or even use some laughing cow wedges. Many of the Amazon UK links are affiliate links, so if you click on them and buy something, I do get a tiny percent. This post has not been endorsed by Amazon or any of the products and websites mentioned in this post and I have not received compensation for writing this post or making any videos. 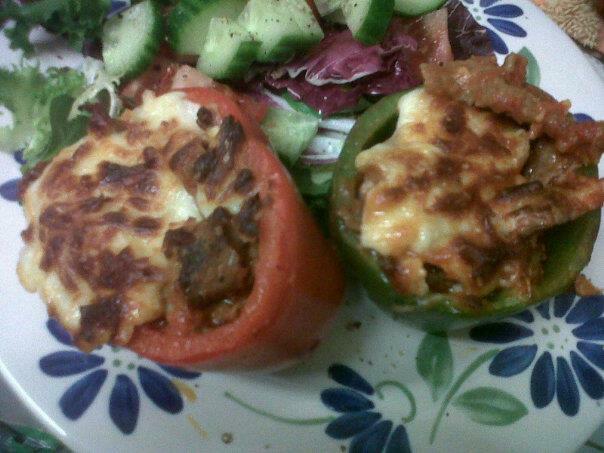 Recently, at my Slimming World Group, we had a taster night in honour of one of our member’s birthdays. It wound up being a double…no, triple celebration as my friend was celebrating her 40th birthday, reaching target, AND losing five stone! So proud of her! Anyway. Since it was her birthday, I really wanted to make some kind of low syn cake treat. The Internet is full of suggestions for low syn cakes. Most of them are flourless and use beaten egg whites to make the cake part, or use crushed Scan Bran or Weetabix or Ryvita. But I wanted proper cake. Enter, this Weight Watcher’s recipe! 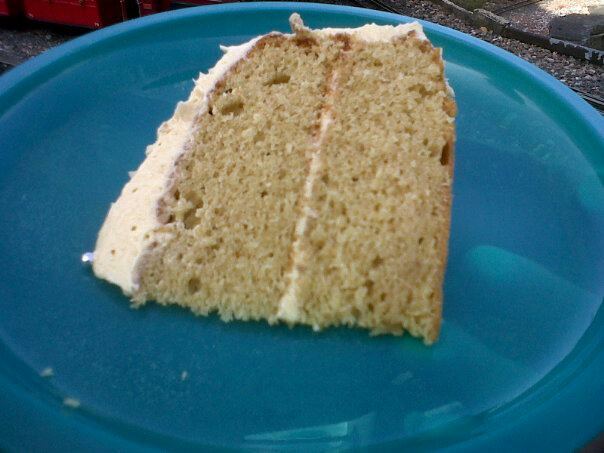 The original recipe states that you can use ANY diet soda with ANY box cake mix. But since Slimming World and Weight Watchers use different criteria for determining points and syns, I needed to use the online calculator to work out the exact syns for my cupcakes. 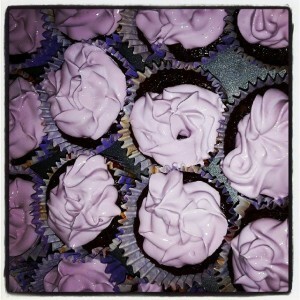 So if you use the exact ingredients I’ve used and make 24 cupcakes, each cupcake will be 4 syns. Any other brand or type and you will need to use the syn calculator. 2. combine dry cake mix and Dr Pepper Zero. No other ingredients are needed. 3. Evenly divide between the cupcake papers. I discovered 2 Tablespoons per cup will evenly divide it. 6. Pour Quark into a bowl and slowly mix in the sweetener. I used about a mugful, but you might need more or less depending on your sweet tooth. I also added some red food colouring (but I wasn’t satisfied with the result, so I added blue to make violet). If you don’t add colouring, your icing will be white. 7. Pipe or spoon the icing onto the cupcakes. You will need to store these cupcakes in the fridge because of the Quark icing. About a week later, I made a Carrot Cake mix with Fanta Zero, and I would be willing to try a yellow cake with Sprite Zero. I bet a chocolate cake made with Cherry Coke Zero or Cherry Pepsi Max would be good, too. Terry Pratchett’s death has hit both my husband and I hard, perhaps him more than me. While discussing dinner tonight, Tim jokingly suggested Sausage-inna-bun and Rat-onna-stick ala CMOT Dibbler. 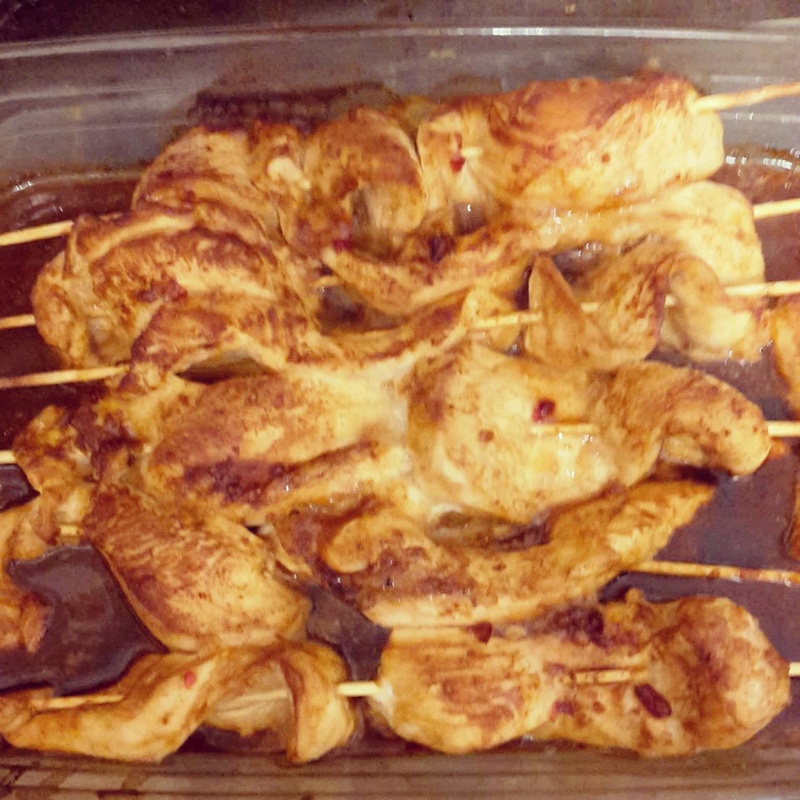 So, I decided to make Chicken Satay. If you make 7 sticks, each stick is only half a syn. *PB2 is a powdered peanut butter available on Amazon that has only 1 syn per Tablespoon. You will need to recalculate the syns and omit the water if you use a different brand. 3. Combine PB2, water, soy sauce, and sweet chili sauce and whisk until smooth. 6. 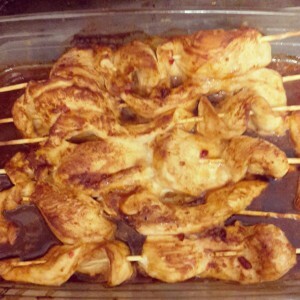 Place skewers in an oven proof dish, pour remaining marinade over chicken and bake for 20 minutes. Adventures in Cooking: I Made Risotto! At our recent Slimming World taster evening, one of the ladies made the risotto out of the August Slimming World magazine. It was delicious, and it was the first time I had ever had risotto. I just don’t like rice a whole lot so I don’t eat it often and I rarely make it. Even when we have a Chinese or Indian takeaway, it’s a struggle to eat the rice (even though it’s a fabulous free food!). When I got home, I mentioned this recipe to Tim and he asked if I would try it……ah, the things we do for love. The original recipe was called (I think) Butternut Squash Risotto. Naturally, it called for a butternut squash. Which I didn’t have. But I did have something called an “onion squash” (called that, I’m guessing because it looked like a giant orange onion) I bought at Waitrose a few weeks ago, so I decided to use that. 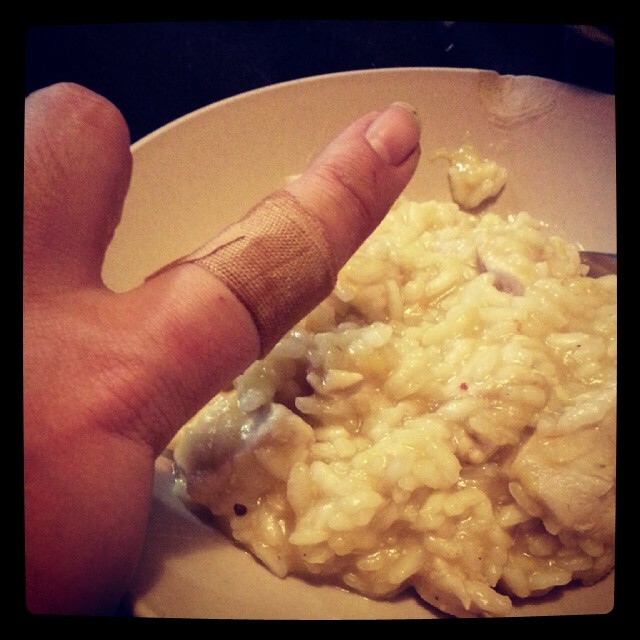 Cutting into it was tough…so tough my big knife slipped and took a slice out of my knuckle. Ow. Disaster #1. I decided to pull out some pumpkin puree from the freezer instead. I also decided to add some chicken to the recipe, as that’s how we had it at group and it was really good. The recipe also called for onion and garlic (which I omit always due to allergies) and a red chili…which I didn’t have, but I had some dried red chili flakes, so those would have to do. After cooking the chicken and the veg, the next step is adding the risotto rice and BOILING HOT STOCK one ladleful at a time. The dish has to be kept constantly stirred and the idea is you add a ladle of stock, stir, let it absorb, and repeat until you have one last ladleful of stock to put in. So, ladle in one hand and wooden spoon in the other I began. After 2-3 ladlefuls, my wooden spoon slipped and >SPLAT< a spoonful of boiling hot stock and rice landed on my hand. Ow. I dropped the spoon into the dish and ran my hand under cold water. Disaster #2. I carried on, though I only used 700ml of stock when the recipe called for a full Litre. I can only assume this is because I used pureed pumpkin instead of chunks of squash. Since it looked awfully goey, I took it off the heat, didn't bother adding the last of the stock and stuck a lid on it for 3 minutes. As I was dishing it out I discovered that when I stopped stirring it to tend to my burnt hand it caused some of the rice to stick to the bottom of my cast iron dutch oven. Disaster #3. But the risotto was yummy, and Tim even went back for seconds! I decided the best way to try to clean this would be to add some water to the pot, squirt in some Fairy Platinum, and boil it for 20 minutes to hopefully loosen the stuck on rice. After 20 minutes I took the pot off the heat, grabbed a scrubber and started scraping....and splashed my other hand with boiling hot water. Disaster #4. Fortunately, I was able to shift all the cooked on rice and have rescued my pot. Would I make this again? Sure! But I think I'll be more careful....maybe wear some gloves. 1. Spray the bottom of a heavy pot with fry light and add the chicken and cook until the chicken is browned on all sides. 2. Add pumpkin puree and the pinch of red pepper flakes. 3. Add risotto rice and simmer for 2-3 minutes. 4. Add a ladle of stock, and cook for 2 minutes (or until stock is absorbed), stirring constantly. 5. continue to add stock in two minute intervals and continually stir. 6. About 15 minutes later, you should be on the last ladleful. Remove pot from heat, stir in the last ladle of stock, season with salt and pepper, and cover for 3 minutes. When the Fakeaway book came out I honestly wasn’t sure if I was going to get it. 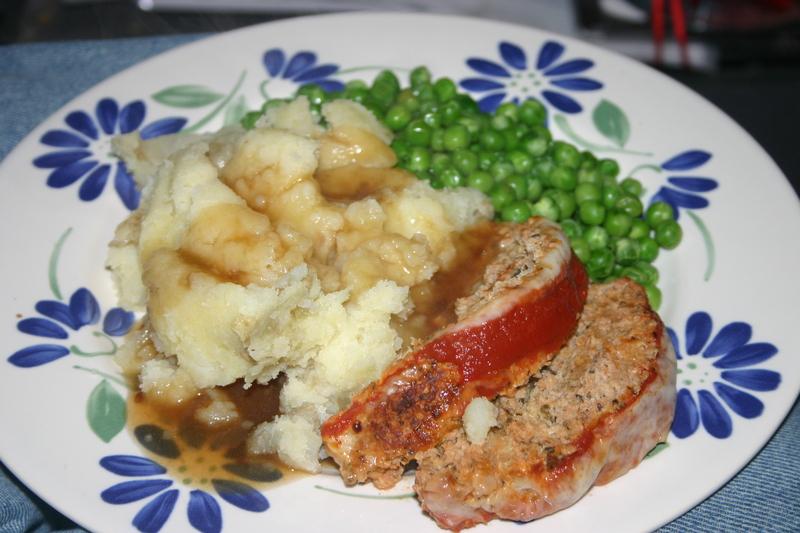 It seemed silly, when there are loads of changes you can make to existing recipes to make them Slimming World friendly, but at the same time I thought it might be useful for some new ideas. Last week, I bought it, and the first thing I did was tab off all the recipes I wanted to try….and I tabbed 24 of them! So this week, I plan on trying FIVE new recipes out of the Fakeaway book. Of course, I always have to add my own flair to the recipes and I never use things as written in the books, so if I modify a recipe enough that it is different from the recipe in the cookbook, I will share them with you all. Flipping through the book, one of the first things that caught my eye was the fake KFC. My husband likes KFC, but it’s so greasy I swear it leaves a lump in your stomach. 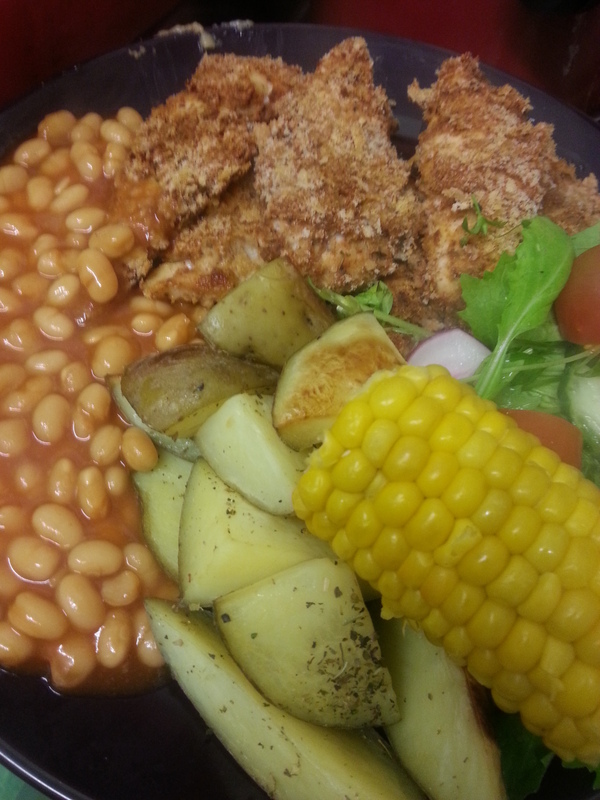 Fortunately, the crew at Slimming World have developed a non-greasy, SW friendly version, so here is my version of KFC style chicken fingers. If you make the full dozen, each finger is 1/2 Syn. 3 – in a separate bowl (big enough to dip your chicken in) combine passata, chilli powder, celery salt, herbs, and a few grinds of the pepper mill. Fold in the egg white. 5 – bake 30-35 minutes. If you start preparing your potato wedges/chips while the oven is pre-heating, you should be able to put both chips and chicken in at the same time and if you’ve pre-boiled the potatoes, they will take about the same amount of time as the chicken. I took the chicken out and raised the temperature on the chips for 5-10 minutes to crisp them up. UK KFC is different from the KFC in the USA. There are no biscuits or mashed potatoes and gravy. Instead, you can get your chicken served with baked beans, chips (fries), and corn on the cob. Beans, potatoes, and corn are all FREE on Extra Easy (and on Green too, I think). For a dipping sauce, I took some Fromage Frais (also FREE) and added some dried chives (FREE) to make a mock sour cream & chives, or you could make Slimming World BBQ sauce. My dinner tonight cost me 3 Syns, and that was including the ketchup for my chips! Quite tasty, and my husband said it did taste similar to KFC. About a week or so ago, I posted to my Facebook page that MÃ¼llerLight Coconut with Chocolate Sprinkles yoghurt tasted like eating a Bounty (US: Mounds) bar and I was in heaven and my friend Paul commented with a recipe for chicken korma involving the yogurt. I was dubious as chocolate sounded like a strange ingredient, but tonight I decided to try it. 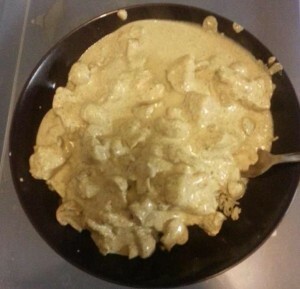 I ran out of Korma powder, so mine was made with half Korma and half Garam Marsala, but it was still ridiculously creamy and “gooey”, as my husband called it. Definately going into regular rotation! -Transfer the spice to a large pot and stir in the yoghurts, Quark, and sweetener. Heat over low heat, making sure you don’t curdle the yogurt. – Stir in the tumeric. -Once the chicken is cooked, stir chicken into the sauce and keep on very low heat. -add the mushrooms (and optional onions) to your griddle (or frying pan) and cook for 5-10 minutes or until soft. Divide into two portions and serve over rice. Yum!! Today (er, yesterday) was a friend’s birthday. A few weeks ago, she told me she was going to purchase a cake to celebrate with, and I said “no, I’m making you a cake”. And then I went on holiday to the US and promptly forgot until I looked at the calendar over the weekend where I had written “make Helen a cake” on Thursday! So what to make? Like me, my friend is diabetic, so I sent her a text and asked her if she wanted a “good for us” cake or something gooey and naughty and gooey and naughty won out. She had no flavour preferences, so I started racking my brain for something interesting and I kept coming back to the Black Forest Gateau I made for a different friend’s birthday several years ago. 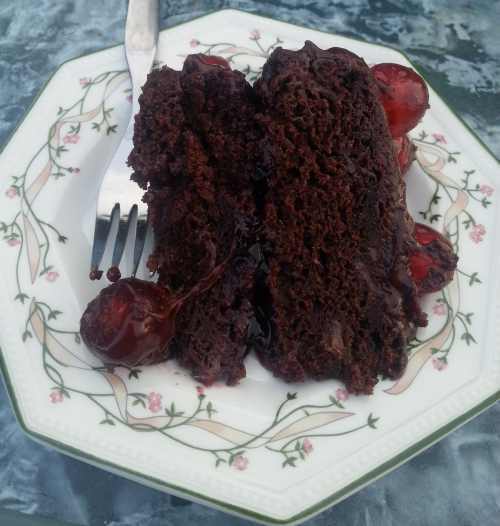 The problem was, I really wasn’t in the mood to make a full on Gateau with layers of biscuit and cream, so I settled on somehow combining chocolate and cherries. Well, this is a hard combination to find recipes for. Either the recipes called for loads of crazy ingredients (one recipe had both buttermilk and sour cream in it!) or they weren’t for a layer cake. I specifically had the idea in my head that there would be cherries IN the cake, between the layers, and on top. I also thought it would involve cherry pie filling and/or cherry jam as opposed to fresh cherries. I was right. Scouring Pinterest, I came across a Betty Crocker recipe that I am almost ashamed to say is the recipe I settled on! -Combine dry cake mix, eggs, pie filling, and vanilla. As you stir, the cherries will start to break up. This is fine. -Place the first cake upside down on your serving plate and spread with cherry jam. I used about a half of the jar, you can use more or less. I also added the extra cherries leftover from the pie filling. -Put the second cake on top of the jam. -Scrape out the cherry pie filling tins and spread the leftover “jelly” on the top and sides of the cake. -Decorate with glace cherries however you like. I was told this cake was amazing, and the taste I had was really good. The cherry and chocolate flavours both really come through nicely. I can’t take credit for this recipe. Credit belongs to Peace, Love, and Low Carb, but I modified her recipe to fit to what’s available in the UK and to my personal preferences. This is a great low-carb dinner when paired with a salad! 2. Slice off the tops of your peppers and remove the seeds as well as as much of the membrane as you can. If your peppers won’t stand up, you might want to prop them up in ramekins or in a casserole dish with sides. 3. Using your biggest frying pan (I use my wok), sauteÃ© the mushrooms in a little olive oil until they are soft (about 10 minutes). 4. Add the strips of roast beef and cook an additional 10 minutes. 5. Add a sprinkle of Oregano to your passata and add the passata to the mixture. Cook until bubbly. 6. Sprinkle a little mozzarella in the bottom of each pepper cup and ladle in the meat/mushroom/sauce mixture. Top each pepper with some more cheese. 7. Bake 15-20 minutes until cheese is melted and golden brown. I made 2 peppers for myself and used half a baguette to make open-faced sandwiches for Tim (he doesn’t like peppers and isn’t eating low-carb) and there is still loads of mixture leftover to save for another day, so I bet this would easily fill 6-8 peppers. Each pepper has approximately two soup ladles of mixture in it. One thing I really like having on a cold evening (like the ones we have been having!) is hot chocolate….which at first, seemed like it would be a huge no-no for me, but I’ve figured out TWO ways of making diabetic friendly hot chocolate….one that can be used as an “instant” with hot water, and one that requires milk. No photos for this entry….I think we all know what a mug of hot chocolate looks like! Combine cocoa and Splenda together in a small bowl, then measure out a few teaspoons and add to a mug of warm milk…use as much or as little as you need to get it to the consistency you like. I tended to use about 3-4 teaspoons of the mixture for a large Cath Kidston mug. This mix can be made ahead of time and stored until you want it, just use equal amounts of both! Combine all three ingredients in a small bowl, then measure out a few teaspoons to add to a mug of hot water. Use as much or as little as you’d like. Again, I used about 3-4 teaspoons for a large Cath Kidston mug. This mix also can be made ahead of time, again with equal parts of each item. You also could easily make it a cappucino by adding in some instant coffee, or using instant coffee, cocoa, splenda, and coffee creamer (instead of powdered milk). Yesterday was my Father-in-Law’s birthday. Each year since I’ve been part of this family, I’ve made my FIL a rum cake for his birthday, so even though I’m not allowed to have it, it doesn’t mean I stopped baking. 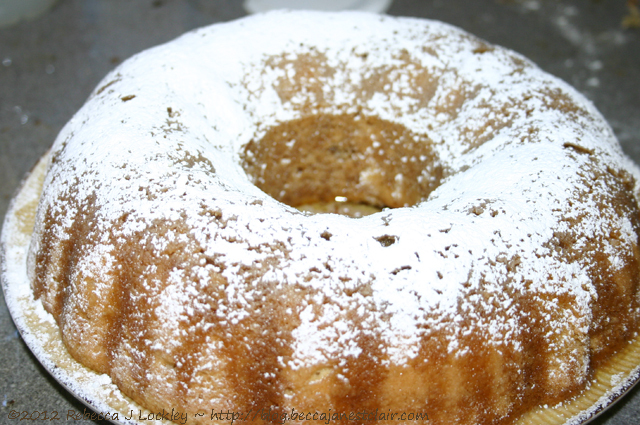 My aunt makes a fantastic rum cake called the “Bacardi Rum Cake” that uses a cake mix and a packet of Jell-o pudding, neither of which is available in the UK, so I had to create this recipe on my own several years ago. It’s withstood plenty of testing, so I’m ready to share it with you all! Preheat oven to 175C. Grease/spray a bundt pan or an 8″ square. -combine flour, salt, and baking powder in one bowl and set aside. -cream together butter and sugar. add eggs one at a time. Slowly add in flour mixture. -add vanilla and rum. Spread mixture into preferred cake pan and bake 20-25 minutes, until golden brown. Optional – Top with crushed pecans before putting in the oven. -Melt butter and sugar in a thick pan on the stove. Add rum and bring to a boil. Remove from heat and stir in vanilla. When the cake is done, cool on a wire rack in the pan for about 10 minutes, then gently flip over onto a serving plate. Using a skewer, poke holes in the top of the still-warm cake and pour on the glaze. This cake doesn’t need any icing, but if you want you can sift some icing sugar over the top. This is always a hit with everyone I make it for, though I will caution that it is in fact possible to get tipsy off of a few slices of this! I first discovered the idea on one of the food blogs I regularly read. It was either Serious Eats or The Kitchn and was called “Italian wedding soup”. I’ve previously also seen recipes for “meatball soup”. As my recipe wound up being completely different from either recipe previously posted, I decided to call mine Italian Meatball Soup. -combine turkey mince, egg, thyme, breadcrumbs, and parmesean cheese and form into small meatballs. Flatten the meatballs slightly (they should be about the size of a 50p). Place the meatballs in the bottom of a frying pan or griddle pan and brown meat on both sides. It doesn’t matter if they are cooked through, as they will finish cooking in the soup. This is just to keep them together. You also don’t need to flatten them first, I just found it easier to work with in the pan this way! Another option would be to start with frozen meatballs or even leftover meatballs as that would cut down the amount of time this takes to make. 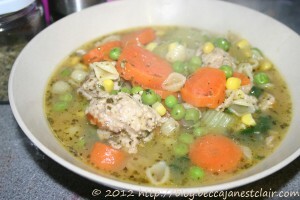 -add chicken broth/stock, thyme, peas, and carrots. Bring to the boil, add basil, then simmer about 10 minutes. -add meatballs, cook for 10 additional minutes. -add spinach and small pasta, bringing soup back to the boil and cook just until pasta is tender (the pack of pasta I used said 5-7 minutes). Squeeze in half a lemon (optional). -test a meatball to make sure it’s cooked through before serving. Sprinkle with parsley just before serving. Tim loved it, and he’s not a big fan of soup as a main meal, but this soup was hearty enough to satisfy him. It made enough for us to have this as our Dinner plus enough leftovers for Tim to take the following day. I had to add some more chicken broth to the leftovers. By far, the easiest bread in the world to make. It goes great with soups and stews! 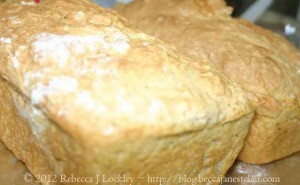 I first made Beer Bread in 2009 out of a box mix that cost over $5.00. We loved the bread, and I knew there had to be an easy way of making this without buying a pre-made mix, so off to the search engines I went. There are loads of recipes out there for beer bread and some of them can get quite involved. This recipe is so simple, anyone can make it. You can even mix the dry ingredients together ahead of time, pop it into a jar and give to a friend with a bottle of beer for an instant gift. 1. Pre-heat oven to 180C. Butter the sides and bottom of a loaf tin. 2. Mix together dry ingredients. Slowly add beer (it will foam) and use a wooden spoon to mix until sticky. 3. Pour into loaf tin and bake 50-60 minutes or until the top is crunchy. Cool tin on it’s side on a wire rack for 10-15 minutes before removing bread. This doesn’t even need any butter, it’s tasty without it! I might be posting a lot of recipes in the next few days as I seem to have a lot of recipes I haven’t yet posted! The contents of this post, including images are © Rebecca J Lockley and Tim Lockley unless otherwise stated and should not be reproduced without permission. If you are not reading this on http://blog.beccajanestclair.com, my facebook page, the RSS feed(s), or through an e-mail subscription, please notify me. To make a long story short, I offered to bake my friend Brian a cake and gave it to him when we saw him on Sunday. Brian decided to donate his cake to the group we were with, so everyone got to have a taste and everyone who had some complimented me on it! So, here you go. How to use 500g of butter in one go…. 1. Pre-heat the oven to 190C and line your cake tins with some parchment paper. 2. You’ll be making the sauce first so it has time to cool. Melt the butter and two sugars together over low heat for 15-20 minutes until sugars are dissolved. If it doesn’t look like syrup, add a tablespoon of butter (I used olive spread) to make it a little runnier. Remove from heat and add vanilla. 3. While that’s cooling, start on the cake. Use a wooden spoon and beat the softened butter. Add the two sugars and continue to use a wooden spoon to mix it together until it becomes fluffy and golden in colour. 4. You can switch to an electric hand beater for the rest. Add in each egg, one at a time, with a Tablespoon of the flour each time and beat thoroughly before adding the next egg. 5. Beat in the vanilla, and add the remaining flour. The mixture should be thick enough to reluctantly drop off a spoon. If it’s too thick, add a tablespoon of milk. 6. Divide between your two pans and bake for 15-20 minutes. Remove from the oven and cool in the pans for 10 minutes, then turn into a wire rack to finish cooling. 7. Time to make the buttercream icing. You will want to clean off your electric beaters for this. Beat together the cornflour, sugar, and eggs until blended and bright yellow in colour. 8. Add butter one cube at a time, mixing constantly. 9. Pour in the butterscotch sauce and mix together. 10. To put the cake together, just sandwich the two layers with a small bit of the icing, and ice as usual. This past Christmas, I was sent a copy of the Hairy Biker’s Perfect Pies by my Secret Santa from an Ex-pat group. I’m not a pie person, and as you know, I’m quite loyal to Jamie Oliver, but I paged through the book and marked a bunch of the pies that looked like Tim and I would like them. Last week when I was meal planning, I read out the pies to Tim, and he picked this one. I had planned to serve it with poached eggs, but I forgot to poach the eggs in the end! Oops. As always, my recipe has been slightly modified due to my own dietary restrictions, and based on what I thought would work better. 1. Pre-heat the oven to 200C. Quarter the potatoes and put in a pan of boiling water. Bring to the boil and simmer for 10 minutes or until soft. 3. 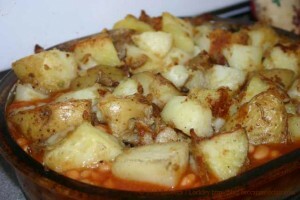 Put the sausage in the bottom of a shallow casserole dish and cover with beans. Set aside. 4. Drain and roughly cut the potatoes into chunks. Don’t worry about the skins. Some of the skins will fall off after boiling, some won’t. 6 – Bake at 200C 15-20 minutes until potatoes are crisp on top and the beans are hot. I think this would have been tasty with a poached egg on top, but Tim thought it was okay on it’s own! A few years ago, my sister-in-law gave me one of those cupcake cake tins made out of silicone and joked that she gave it to me so I would make her a giant cupcake. The pans sat in the box in the kitchen until one day I finally opened the box, gave the kit a wash, and stuck it in a cabinet. I kept thinking about using the cake pan, but ultimately would make something else, or not be in the mood to play around with it, so it just sat there. 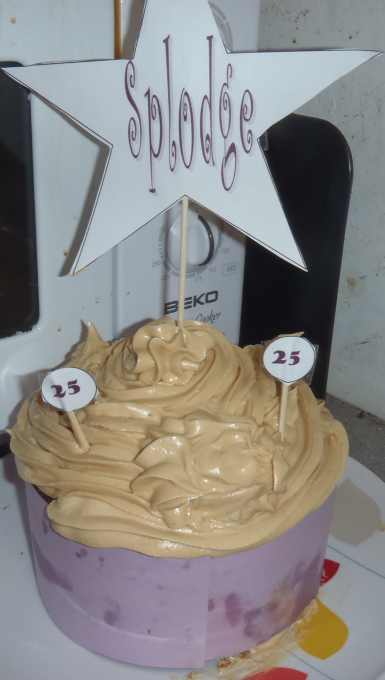 My sister-in-law loves peanut butter, and when I was in PA in December, I was reminded of Peanut Butter Icing…which of course, needed to go on a cake for my SIL. Since her birthday was this past Friday, I decided to break out the big cupcake. My sister-in-law also likes white chocolate better than milk, so I had decided on making her a white chocolate cake with peanut butter icing. For the white chocolate cake, I just took a regular chocolate cake recipe and where it called for melted plain chocolate, I subbed in 200g of melted white chocolate, and I used some white hot chocolate mix in place of the 4 tablespoons of unsweetened cocoa. I also removed a few tablespoons of sugar from the recipe to compensate for the extra sugar in the white chocolate. The directions said to spray the cupcake bottom, top, and insert with cooking spray, so I did that and followed the directions which said to fill the bottom part up to the line on the inside (about half way) and to fill the top part 3/4 of the way. The piece that makes a hollow hole in the bottom for filling is optional, so I snapped it in place thinking it’d make a nice little cave for some peanut butter icing. Baked for 20 minutes, and it wasn’t done. Baked it for 15 more minutes (total 35) and it still wasn’t done, but in fact the bottom part of the cupcake had spilled out over the side of the mold and was baking itself into a little pile of cake on the baking tray I sat the molds on. The lid was still in place on the bottom though, so I assumed it would still have an indention. I set the timer for a further 15 minutes (total 50 mins) and both halves appeared to be done so I removed them from the oven…. The TOP piece developed an indention while it was cooling and appeared to be brown in colour on the sides. The BOTTOM piece did not have the indention for filling anymore, and when I removed it from the silicone mold, it appeared to SHRINK in size. Since I had the indention in the top piece, I decided I would still put some icing in the middle and I attached the top piece. Due to the shrinking of the bottom piece, it looked like a mushroom instead of a cupcake, and I discovered the bottom piece started to buckle a little under the weight of the top piece and it appeared to have a hollow bit….ALL THE WAY IN THE MIDDLE OF THE CAKE. So I used a spoon and shoved in some peanut butter icing into the hole. Why not? Since I wanted a cupcake and not a mushroom, I decided the best thing to do would be to make a cupcake “liner” out of card stock and arrange it to make the bottom look closer to the same size as the top. my SIL’s favourite colour is purple, so I used purple card stock. Then, to hold it together better, I took a bamboo skewer and stuck it through the middle of the cake. Since it would stick out the top, I made a sign on the computer with Tim’s nickname for my SIL in the shape of a star to tape to the skewer. I made the Peanut Butter icing and piped it on using a Wilton 1M tip – the same size tip I would use on a normal-sized cupcake. I decided the icing wasn’t peanut buttery enough, so I added a few extra desert spoonfuls of peanut butter, a little more milk, and a little more sugar. Basically, make the icing to your own taste. Hopefully, the cake tastes okay – I’m waiting for my SIL to text me! Tim and I were shopping at the co-op a few weeks ago, when he spotted some pre-made potato skins in the refrigerated items section. The container had 6 potato skins in it, and the co-op wanted over Â£3 for it. I told Tim not to buy it and that I knew I could make this at home quite easily. Preheat your oven to 200C. Slice each potato in half horizontally and place skin side up on a lined baking tray (or spray it with oil). Brush olive oil on the skins. Bake for 30 minutes. Remove from oven. Wearing an oven mit, pick up each potato half and using a large spoon, scoop out most of the inside. You won’t need it for this recipe, but you can save the insides for mashed potato at a later time. You should be left with a mostly hollow shell. If you scooped too much out, you can put a little of the potato back inside the skin. Crumble the bacon and sprinkle it over the skins. Top with grated cheese. 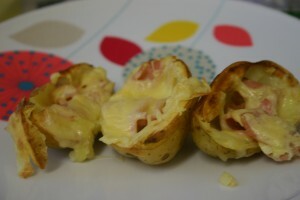 Put the potato skins back into the oven for 10-15 minutes, or until the cheese is melted and bubbly. Just as good as store bought or restaurant made for pennies! Apologies for the bombardment of recipe posts recently, but I’ve been getting creative in the kitchen lately and want to share. As I was taking a photo today of my latest creation, I commented to my husband that I “really take a lot of photos of food”. He replied that since food seems to be my latest creative outlet, why not? Of course, this does mean you have to read post after post about food, when you probably want to read other things by me. Sorry! Maybe I should start up a cooking blog after all! 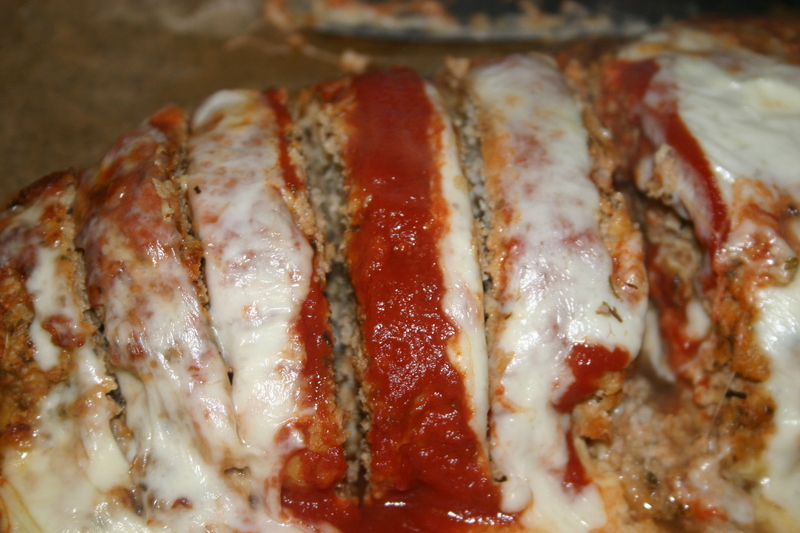 When I was younger, I remember my mom making Pizza Meatloaf, probably because I had seen it in a kid’s cookbook or on TV or something like that. I couldn’t find her recipe, so I created one of my own. Pre-heat the oven to 225C. First, chop about half the Mozzarella into small cubes and the other half into slices. You also could use shredded cheese if this is easier and divide it in half. Combine meat, the cubed cheese, HALF the passata, the bread crumbs, egg, and Oregano and mix together well. Shape into a loaf shape on a lined cookie sheet. Cook 45 minutes to an hour, or until meat is no longer pink. 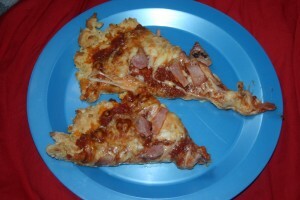 Remove from oven and pour over remaining half of passata and top with remaining Mozzarella. Put back into the oven for 15-20 minutes, or until cheese is melted. This was really tasty the following day cold in a sandwich with some ketchup! I was going to hold off on this post for a few weeks and get some older (well, a few weeks old) recipes posted, but Michelle’s post on The American Resident about homesickness and making comfort food prompted me to post this sooner. I think most of us who grew up middle class in America know about Chef Boyardee. Those red cans (I swear, it used to be spelled Boy-R-De) were a familiar food growing up. My favourite was the ravioli, and I detested beefaroni. In addition to tins of pasta, Boyardee also made pizza kits, which became a household staple because it was easy to make, and we could put whatever toppings on it we wanted. Even as an adult, I continued to buy the Boyardee pizza kits because they were inexpensive, and had everything I needed – crust mix, tomato sauce, and cheese. Of course, we started adding shredded cheese to the grated Parmesean by this point. I love pizza and I love homemade pizza. 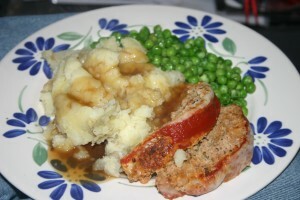 Moving to the UK, I’ve struggled a bit in finding a crust mix that I like – a lot of the pre-made mixes don’t cook well or taste too sweet and I just don’t have the patience for making it from scratch. Originally, this recipe was just going to be “Easy Pizza”, but when I bit into it I was instantly reminded of the good old Chef Boyardee pizza mixes. I hope this can comfort another ex-pat the same way it comforted me! *optional ingredients. The main ingredients are essentially the items you need for a Chef Boyardee kit. Any direction involving optional ingredients will have an * in front of it. Grease or line a cookie sheet (or pizza tray). Combine water and Bisquick and mix until it resembles dough. If there is still a lot of powdered mix, add a little more water. Press dough onto cookie sheet and lightly cover with olive oil (a spray bottle is ideal). Remove from oven and top pizza with sauce and *sprinkle oregano and basil on sauce. Sprinkle Parmesean cheese over sauce. Return to oven and bake for an additional 10-15 minutes or until cheese is melted and crust is crisp (it took 12 in my oven). But I should back up a little and tell the story. The first part of the story is from about 10 or so years ago when my mom and I were looking for something we could make our office friends for christmas that wasn’t going to break the bank, and we discovered a recipe for cappuccino mix. We made it and everyone loved it – my aunt so much that she gave us her empty container and asked us to refill it! The second part of the story comes from a girl obsessed with Starbucks. Me. When December rolled around, my favourite drink was an iced peppermint mocha or a frappucino. One year, I mentioned to the barista how sad it was that the peppermint mocha was only offered in December, and she told me I could order it regularly and ask for a shot of peppermint. It would cost me an additional fee for the flavour, but I was able to get peppermint mocha year round. …and then I moved to the UK, where Starbucks does not have peppermint mocha. My mom found an International Coffee powdered version that she sent me and I gobbled it up. 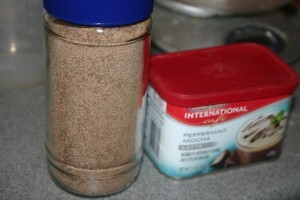 She also found peppermint Coffeemate powdered creamer and sent that along. Recently, I’ve been looking at the second caninster and thinking about making something with it, when I remembered the old cappuccino mix recipe. 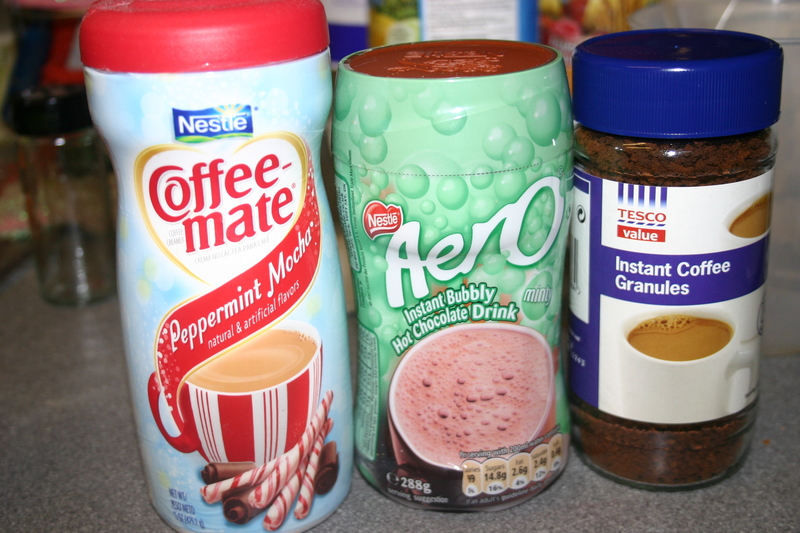 To make it even minty-er, I decided to use mint hot chocolate mix, and to get it to “froth”, I picked Aero hot chocolate. You can make this with regular creamer and regular hot chocolate or any flavour hot chocolate and regular creamer. If you can’t find regular creamer, you can use powdered milk. So, here’s what you need. I did the measurements for this in Metric, but as long as you get the ratios right, you can use any measuring system you want. you also will need a plastic zipper top bag, a rolling pin or glass, and some containers to put the finished product in….like the containers you just emptied! Step 1 – Pour the coffee into the zipper-top bag, squeeze out as much air as you can, and seal it. Gently roll over the coffee with a rolling pin to break up the granules. Step 2 – Add the hot chocolate, powdered creamer, and splenda to the bag. Seal it up tight and shake it until everything is mixed together. Step 3 – Pour into containers. When you are ready to have some, just put 3-4 spoonfuls in a mug and top with hot water. I like to fill my cup about 3/4 with boiling water from the kettle and then top it off with cold water from the tap so I can drink it right away. This would make a great gift, too!